Through the years, the automotive industry has evolved significantly and today, it has captured a great market. Indian is the 4th largest automotive market, primarily driven by two-wheelers. However, migration to major metros in almost every Indian state is pushing the cost of vehicle ownership higher and higher. This is reflected by the slowdown in the sector’s growth, last year. As the congestion in our cities rises, many are finding it increasingly difficult to own a vehicle. Moreover, more than 93% of Indians do not own a car and only 16% own a two-wheeler. And today, the demand for cost-effective mobility is skyrocketing in the nation — vehicle sharing is 50-60% economical as compared to ridesharing or cabs. It is prophesied that just like India will leapfrog the world in terms of vehicle sharing services. Started out in 2015 as aggregators in the luxury car rental space, Drivezy had dry-leased a fleet of BMW cars from licensed companies and made money by micro-leasing the vehicles to urban commuters. The company witnessed a quick growth — and in less than a year it operated more than 200 cars in 3 cities. However, at that time, there were not enough licensed leasing firms in the market, which left little room for Drivezy for further growth. 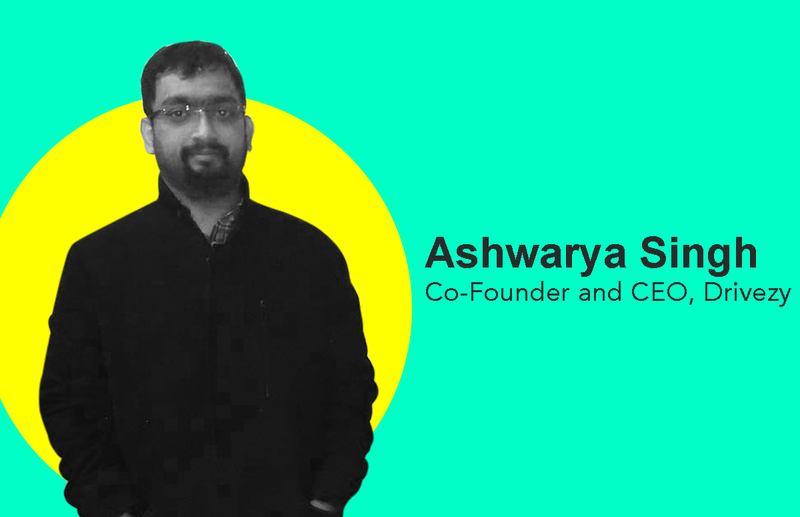 “Around this time, some of our customers began approaching us with requests to enlist their vehicles so that others could rent them when they were not being used,” said Ashwarya Singh, co-founder and CEO at Drivezy. Usually, people don’t drive their cars for more than a couple of hours in a day and their vehicles mostly stay parked. Therefore, the company decided to capitalise this idle time by helping owners rent their vehicles to commuters who need one. But there were challenges. And to overcome them, the company forged alliances with major Indian banks and NBFCs to create a financing channel to help people purchase cars, motorcycles and scooters and enlist them on the platform. In 2017, Drivezy opened its platform to motorcycles and scooters as well, making it the only platform that featured both cars and bikes. Today, with about 2,500 booking requests per day, it has a presence in 11 cities where the company is helping more than 5,000 owners turn their vehicles into earning members of their family. Around 60% of people who have partnered with us are first-time vehicle owners. Also, last year it signed a deal with Singapore based Harbourfront Capital for the listing of assets worth $100 million. In less than two years, Drivezy has enlisted more than 7,500 two-wheelers and is focusing to have more than 12,000 operational two-wheelers by next month. Like most startups, Drivezy began its journey with a monolithic architecture, built for a single offering in a single city. A single codebase solved most of their core business problems which included mostly customer verification, billing and payments. Things changed quickly as it moved into more cities and diversified the products. The company has developed all its product requirements in-house. The key elements of technology include machine learning algorithms to optimise business processes, IoT network to monitor and manage operational vehicles, and website and mobile applications. And the company has deployed a composite IoT system that feeds data inputs round the clock to track and analyse vehicle performance. When customers sign up on Drivezy, the company is obliged to scan and verify their identity and driver’s license. In 2018, when new customer sign-ups shot up by 128%, it began using AI and machine learning to profile customers, verify their driver’s license, image validation of vehicles before starting and ending trips and OCR. And the machine learning algorithms that carry out the customer identity verification are written in Python. Today, as a vehicle sharing platform with a presence in almost a dozen cities, Drivezy generates a considerable amount of complex data every day. And it uses analytics in almost all of its verticals of business, right from driving customer retention to all the marketing campaigns. “We optimise our pricing algorithms on historical data and constantly tweak our products and offerings based on the results. We have also developed an analytics system that helps owners track their monthly earnings, bookings received, and status of their listed vehicle,” said Singh. Being a startup with a highly modular operational structure that allows the company to innovate constantly, Drivezy always looks for people with a passion to achieve something big. Also, the company has an induction program that aims to acquaint every candidate with the details of other divisions in order to help the candidate develop a better understanding of our business and work in tandem. “Our engineers have direct access to mentors at Google who guide the development of our core technology and integration of new features,” Singh added. That is not all, since inception, Drivezy have maintained a customer-centric approach to creating a positive experience. When developing new products and services, the company make sure to take into account what customers actually need. This process of understanding how people feel about Drivezy and its service has always helped the company to keep its marketing and product development efforts on track. While other companies in the space are buying and deploying our own vehicles, Drivezy is providing a platform that links individual owners, vehicle dealerships and fleet owners to the end consumer. And it believes that this what set Drivezy apart in the industry today. “Cars and bikes have always been frowned upon as they are depreciating assets and quite expensive. Drivezy challenges this notion by helping people monetise their idle vehicles,” Singh concluded. Looking into the future, the company is looking to expand its reach overseas — it is going launch a car sharing pilot in the US next month and hopes to follow it up with more countries in South East Asia. In terms of technology, Drivezy is upgrading its entire fleet with keyless IoT devices that would allow customers to unlock their vehicles through the Drivezy app. Subsequently, it is also planning to launch a one-way rental service for both cars and bikes, allowing customers to pick and drop their vehicles at any of its parking locations.